Comments: Truly BRAND NEW! In stock. 100% Satisfaction Guaranteed. FAST Processing; friendly, tip-top service. :- ) Please compare our seller rating to others; we are the fast, smart, hassle-free choice. Customer service is not a dept; its our attitude. FYI: Standard shipping is 4-14 business days. Deliveries beyond continental U.S. (ex. HI, AK, PR, APO) usually longer. If youre outside cont. US, Please choose priority shipping. Comments: CD INCLUDED! - PLEASE READ! This book WILL contain heavy wear, excessive highlighting/writing, loose binding, AND/OR water damage. Supplemental materials such as CDs or access codes may NOT be included regardless of title. Contact us with any questions! 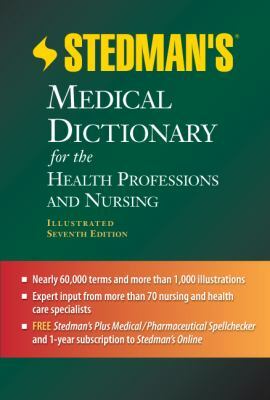 Stedman's Medical Dictionary Staff is the author of 'Stedman's Medical Dictionary for the Health Professions and Nursing: Illustrated Text with CD_Rom for Windows and Macintosh and Internet Access Code F ... Medical Dictionary for Health Professions)' with ISBN 9781608316922 and ISBN 1608316920. Loading marketplace prices 407 copies from $3.10 How does the rental process work?